I was deeply saddened to hear the news of Anne Williams’ passing today. My thoughts are with her family, friends and loved ones. I never knew Anne I never met her, but she was someone for whom I had the utmost admiration and respect. For those who don’t know her story, Anne lost her son Kevin aged 15 in 1989 at the Hillsborough Stadium disaster. At the time the official record stated that Kevin was dead or beyond saving by 3.15 pm, but Anne new this was wrong. A police woman would later give evidence that he was alive and had actually called out “Mum” long after that cruel and arbitrary cut off point was imposed by the coroner. That officer was told to amend her statement. Anne and many others suspected that there was an ulterior motive behind the cut off imposed in the original inquest. If he was dead by 3.15 there was nothing anyone could have done to save him and no questions would be asked of the police and emergency services. This was just one aspect of an alleged over up that fuelled Anne’s relentless quest for truth and justice. Anne turned detective and lawyer in the 24 years that followed. She fought a heroic campaign along with the Hillsborough Justice Campaign (which she chaired initially) and later Hope for Hillsborough. Time and time again she had the judicial doors slammed in her face. Time and time again she went home to gather more evidence, before returning to bang at those doors again. She took it as far as the European Court of Human Rights, only to be told her case was out of time. She would have been forgiven for throwing in the towel there and then. She could have proudly claimed to have done all she could in her sons name. Not Anne. Nelson Mandela once said “Judge me not by the amount of times I am knocked down. Judge me by how many times I pick myself up and carry on.” Anne Williams can be compared favourably to any of histories great fighters for justice. Her life’s achievements will reverberate through time. She is a model for any parent fighting for a child who has been wronged. Inevitably her death, coming just a day after the funeral of Margaret Thatcher has caused those on Merseyside to compare the legacies of both women. Anne herself, speaking on the steps of St Georges Hall after the release of the Hillsborough Independent Panel Report, mentioned an on-line campaign calling for a state funeral for the former Prime Minister. Ironically this petition had inspired Anne to petition the Attorney General to reopen Kevin’s case. It would attract more than 100,000 signatures. 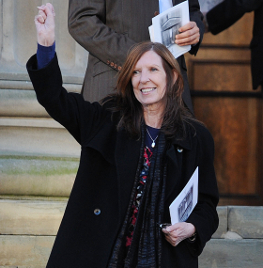 Many have today referred to Anne Williams as the real “Iron Lady”. I believe she is truly deserving of such an honorific. I believe it is easy to be strong when you have the full weight of the state, the police and the media on your side. Try doing it when your a mum fighting a lone battle against that same establishment, whose sole purpose it was to make your life so impossible that you feel tempted to turn away quietly in defeat. Anne, though was not for turning. She fought on, cheered on by a city and a justice campaign that spanned the globe, but always as its leader. Make no mistake she was made of iron. Anne lived long enough to see her sons verdict of accidental death overturned, she saw the original inquest and arbitrary 3.15 cut-off point quashed. She fought for 24 years to exonerate her son, a fan base and an entire city. That she never lived long enough to see full justice is the cruellest of blows, but she could have done no more in her sons name. Yesterday Liverpool City Council declined to fly its flag at half mast in honour of Margaret Thatcher. Their reason? “This is an honour reserved only for the death of Royalty.” Today they lowered it in honour of Anne Williams…..enough said.